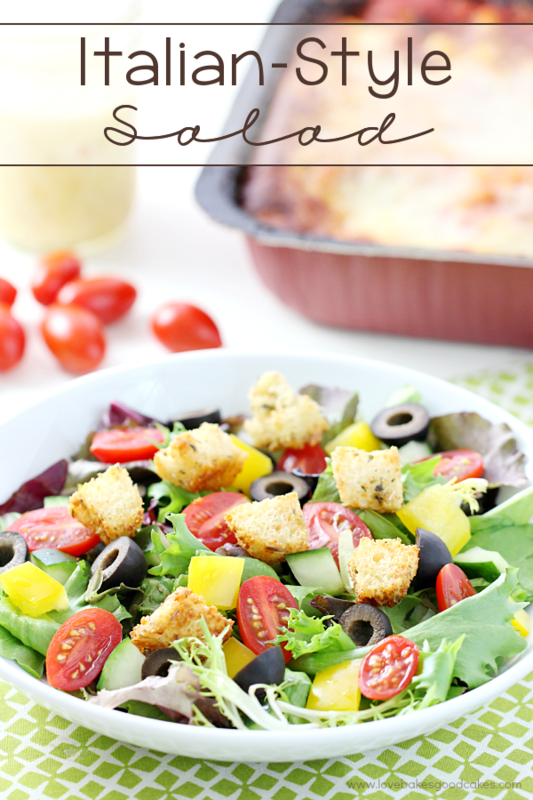 It’s so easy to make your own croutons – and they taste better than the store-bought kind, too! 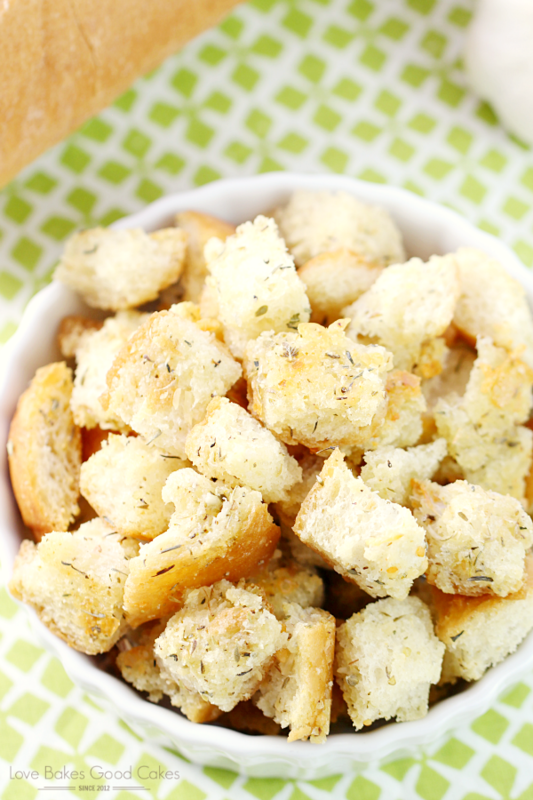 These Garlic & Parmesan Croutons are great on top of salads or soup and they make an easy snack! With the dawn of a new year on the horizon, I’ve been thinking about how I want to make 2016 a better year than 2015 … and although I don’t necessarily believe in making resolutions, I do like having goals! Goals help me know where I’m going and help me stay on track! One of the things I want to work more on in the new year is cutting out more processed food – or food that I can just as easily make (better) at home! Of course, it will take a bit of planning, but it’s something I’ve been working towards for awhile! While I may still grab something from the store for convenience sake, I hope to continue to rely on these convenience products less and less. 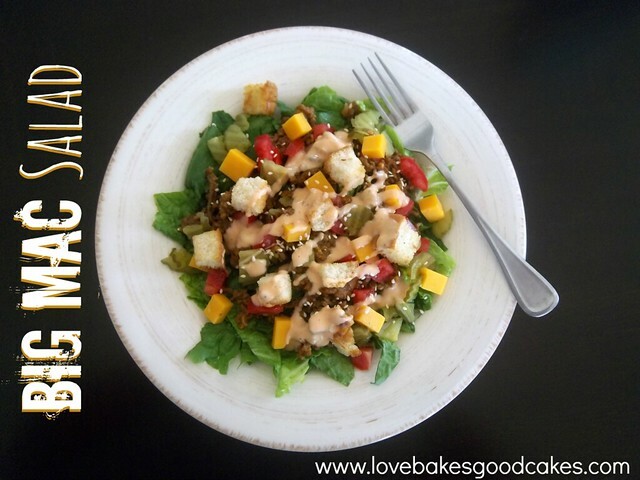 Something that was easy for me to switch out was these Garlic & Parmesan Croutons instead of the store-bought stuff! Not only are most of the store brands over-priced for what you get, but let’s be honest … they don’t really have wow-factor. They’re usually kinda bland … amiright?! I knew I could make them better and cheaper at home, so that’s exactly what I started doing! 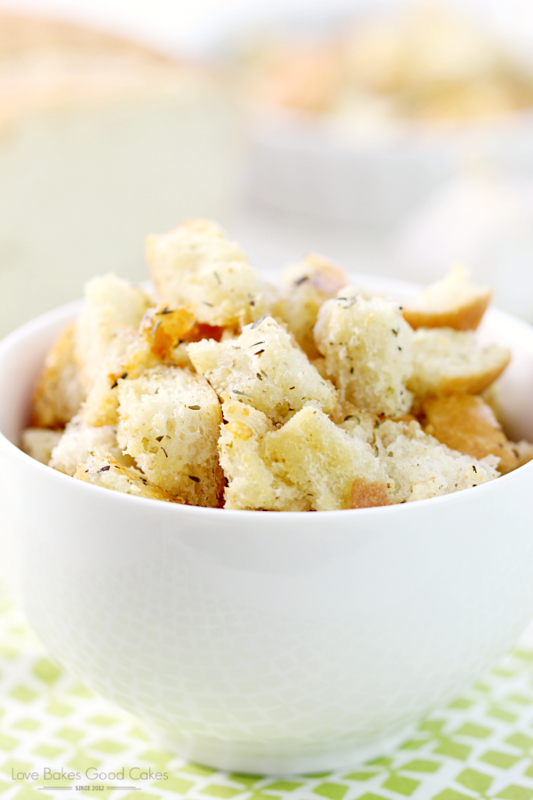 This Garlic & Parmesan Croutons recipe is a good recipe to have on hand. It’s the perfect way to use up the last little bits of bread or bread that has seen better days! 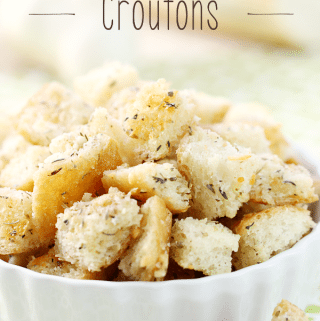 I like to use French Bread to make my croutons since I almost always have some on hand – but I have used just regular white/wheat bread slices too! Once I started making my own croutons, I just can’t justify spending money on the store-bought kind! Not to mention, these homemade Garlic & Parmesan Croutons taste sooooo much better than anything you’ll find at the store! I love them so much, I like to have a few as a snack sometimes! Of course, they’re perfect on your favorite salads – or even soup, too! 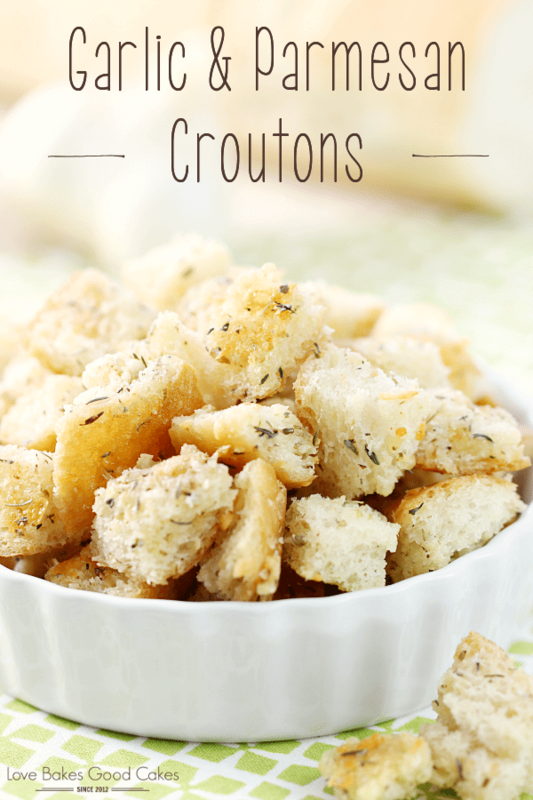 It's so easy to make your own croutons - and they taste better than the store-bought kind, too! 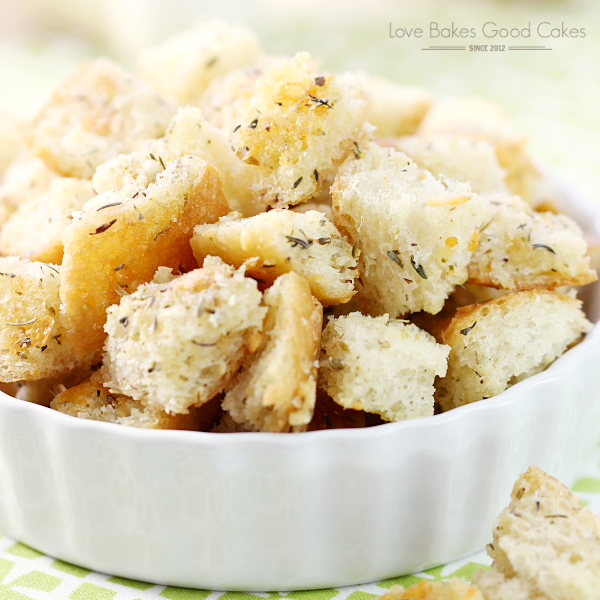 These Garlic & Parmesan Croutons are great on top of salads or soup and they make an easy snack! In a large bowl, mix butter, Parmesan cheese, oregano, thyme, garlic powder, and salt together. Add bread cubes and gently mix with a spatula to coat. Spread coated bread cubes onto a baking sheet. Bake in preheated oven until golden brown, 12-18 minutes. Cool croutons completely before using. Note: You can remove the crusts from the bread if you prefer. Jamie, these look delicious and so much better than from a box! Pinned! Wishing you and your family health, happiness and joy for 2016! Hugs! Homemade croutons are SO much better than store bought. These ones look especially delicious!